Let’s face it; even the most highly motivated can sometimes feel that going to work can seem a bit of a drudge. But there are more times when it can feel really great, particularly for me when a simple conversation can lead to the high I was on the other day, all of which had started earlier in the year. I attended a lunch in March, last minute, as our esteemed leader had to fly off. It was a lunch organised for people who have been in the hospitality industry for many years. Called the HOGGS which stands for Hospitality Old Guys and Girls, but some disparagingly think it stands for old gits. I probably qualify regardless of its title. Amongst its members are some highly venerated people who have now retired, but their contribution to our industry was immense and I spent a very pleasant couple of hours reminiscing about the good old days. It was at this lunch that I started talking to someone about how business has changed and that we now focus much more on things such as local produce, the environment and CSR and how much we in bartlett mitchell take these responsibilities very seriously. We got onto the subject of our charity work and I spoke about some of the initiatives we undertake, including our raising money for wells in Africa. I was aware of someone listening in and it was at this point that he introduced himself and started asking questions about how we were doing with regard to the wells. I mentioned that we were on our way to achieving a 2nd well and he asked how long it had taken us so far. The answer was nearly 4 years. He then gave it some thought and dropped the bombshell that he thought we could have probably raised enough to have funded 24 wells over the same period if we had been with his charity, Thirsty Planet. Some statement! We agreed he would send me details and fixed up a meeting pretty soon after. When I showed what he had sent to our Green Bees, Hannah and Sally at the office, it was met with amazement. As they say, it was a “no-brainer” that we simply had to get it into the business. So what is Thirsty Planet? Effectively it’s a charity brand set up by Harrogate Spring. 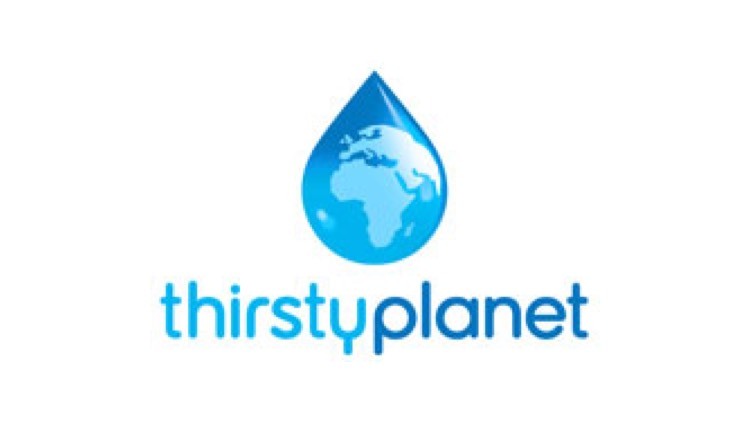 They bottle their spring water under the Thirsty Planet branding and donate 2p for every bottle we buy to Pump Aid, a proven, independent charity who work alongside African communities to provide clean water solutions including the Elephant Pump, which is where our money goes to. An Elephant Pump is a simple, easy to maintain system that uses locally sourced parts in its construction. Over 8,000 of these pumps are in use in Africa and the first one they built in 1996 is still in use, unlike many other more elaborate pumps which tend to fall into disuse if they break down because spare parts are expensive and difficult to source. Pump Aid employ several regional inspectors who travel on mopeds round the villages to ensure their pumps are well maintained. Each village will elect an elder who is responsible for the pump. This individual is often a woman, as women have traditionally been responsible for collecting water for the family. Over 1.2 million people have benefited from these wells. The impact a well has on a community is incredible. Water literally is life and means that health rates soar, mortality rates drop, villages become more developed and self-sufficient as they can grow more crops for themselves and gain food security. It also improves conditions for women, who very often had to walk miles a day to collect dirty water from a river. As villages prosper, there is more opportunity for children to be educated, which is life changing for many. It took a couple of months to set up the distribution and launch of the water but we went live mid-June. By mid-August, we were informed that as we had raised the necessary funds through the purchase of just over a 1,000 cases of Thirsty Planet Water. We had been allocated pump number 3413, which had just been built in the Mchinji District of Malawi, for a village called Kashuku. Not only do we know where it is, but we will get a certificate showing the GPS co-ordinates of its exact location. What’s even more incredible is that we also know that there are 80 inhabitants, comprising of 42 children, 19 men and 19 women living in the village and now they have access to constant, fresh, clean water. When I announced these facts in the office it created such a buzz. That buzz continues, particularly as our clients have now picked up on it and we are now looking at individual locations to raise enough for their own pump. The fact that the targets are not stretching and that we get so much information back from the charity means that all of us are engaged in the project and that we know how our money is being spent and what the benefits are. It’s nearly 3 weeks since I was told we had achieved our first pump and I am still on a high from it.